Have cabinet related questions? We’ve compiled a list of our most common customer questions to get you started on your journey to a new set of cabinets from Bigstone. Can’t find an answer to your question below? Use one of the contact options at the bottom of the page to reach us directly. We’re happy to help! There is 1 of 2 ways you can start:1. If you are comfortable doing a few simple measurements and have an idea of what you would like. Send us a few pictures and measurements of your space and one of our derringers will do a layout and a quote.2. Book an on site consultation. A designer will come to your home and take measurements. They will then return to the office to do a layout and a quote. What types of cabinetry and woodworking does Bigstone provide? Kitchens, Vanities, China Cabinets, Mud Room cabinets, Laundry Room Cabinets, Commercial Cabinets and much more. Do you help me design my kitchen? Yes. We have trained and experienced designers working for Bigstone. They will help you develop a design that works best for your life style. Where are my cabinets made? What can I customize on my cabinets? Cabinet sizes (meaning width, height and depth) are all custom to fit your space. Let us know what you would like to fit in certain cabinets and we will design and build a cabinet to fit that particular item. How long do my cabinets take to be made? Our lead time is 8-10 weeks from sign off. Who installs my new cabinets? We have several experienced and talented installers who install cabinets for Bigstone Custom Cabinets. What type of warranty do my cabinets come with? 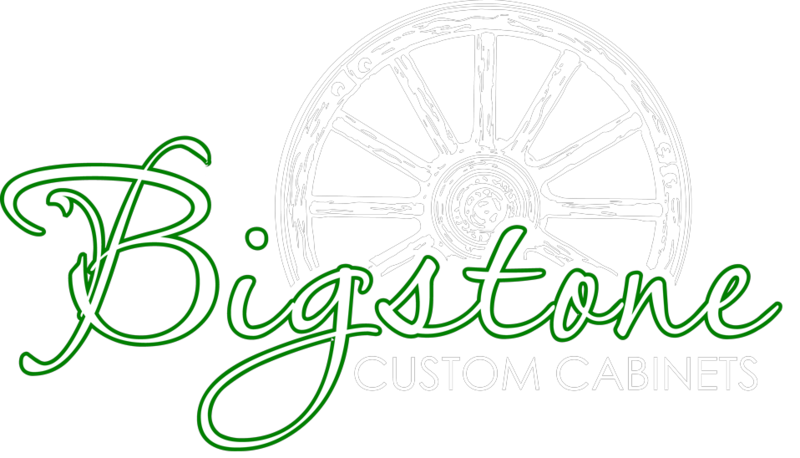 Where is Bigstone Custom Cabinets located?